Cheerful, poppy Thai music suffusing the expansive temple yard, the music at odds with the swelling solemn energy in the crowd as thousands of amber lanterns were held in firm grips. Groups of friends shared a last moment amidst the frenzy making urgent, unspoken wishes for their new year. 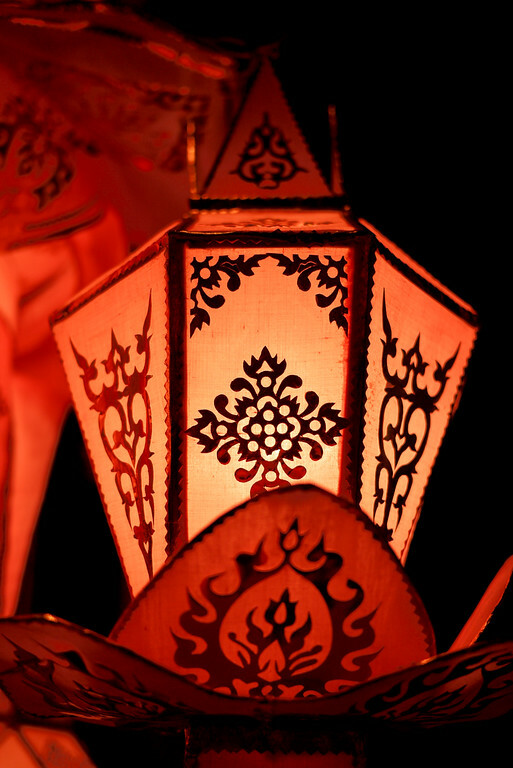 I watched in wonder as our plain white rice paper lantern, a khom loi in Thai, filled with hot air. I looked around me and my breath caught. We collectively waited for the signal to release our lanterns into the night; a sea of open-faced hope surrounded me. 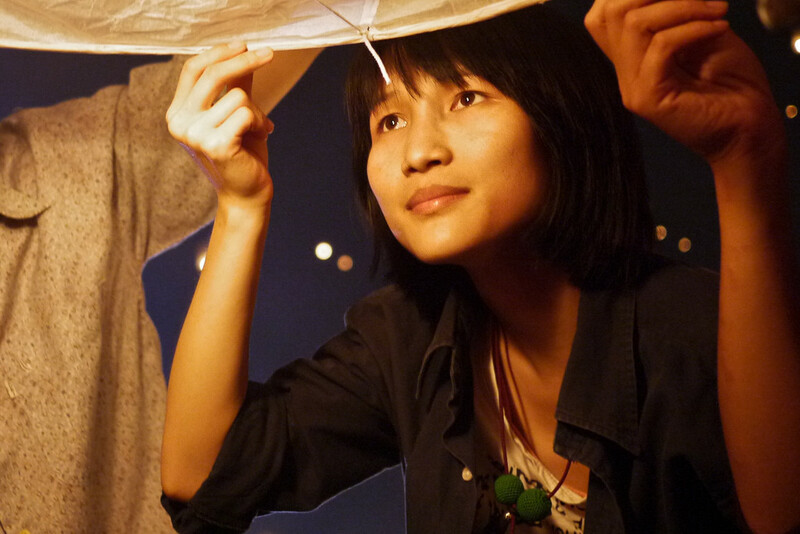 Lighting the center of a paper lantern so it will fill with heat during Loy Krathong in Chiang Mai, Thailand. Expressions indelibly etched on each person’s face showed hope and the lure of infinite possibilities, the promise of a clean slate. It was no doubt written clearly on my face too. I took those last moments to tune out the cheery music and quickly take stock of the previous year, and to look forward with my hopes for the coming year. 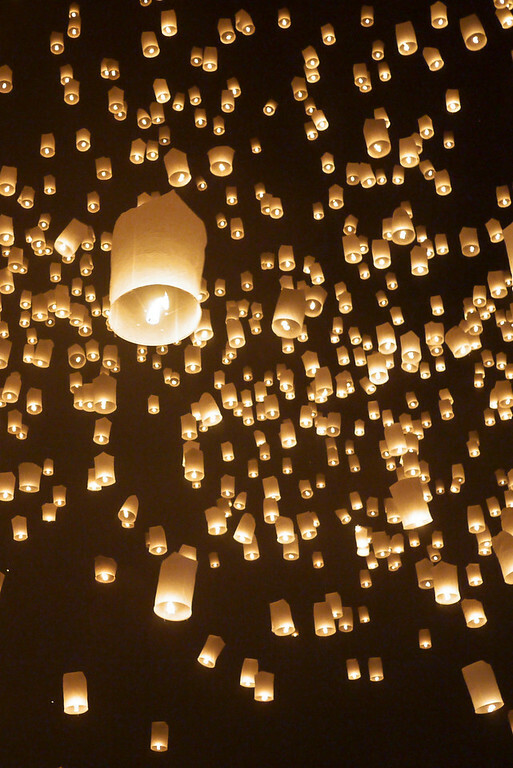 I filled my mind my wishes, hopes, dreams and fears and propelled each one into our group lantern. As I yearned to fill the lantern with that hope, the go-signal gently swept across the huge crowd. 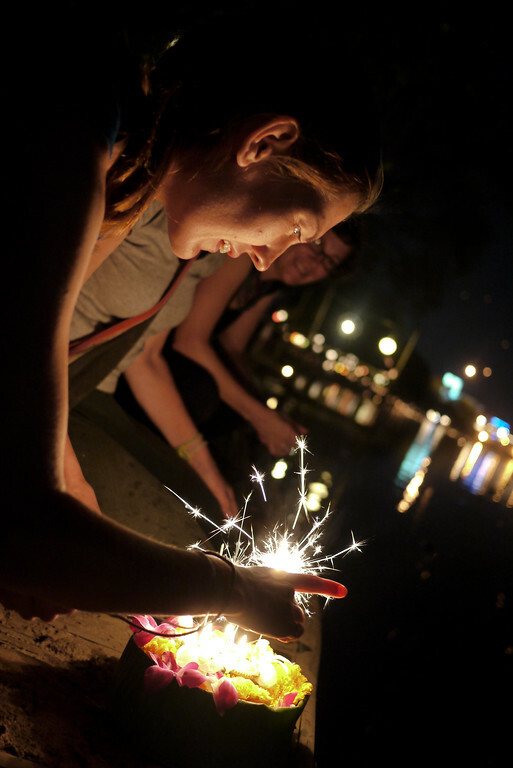 On a pulse of energy, the lanterns slipped from our fingertips. Ours took one unsteady lurch before jolting upward, the cool nighttime breeze collected our orange orb and swept it away from us, into the dark sky. As more joined ours, each illumination shifted the night sky from an impossibly dense black to a deep blue. The sheer number of hopes and wishes seemingly overpowered the night’s ability to stay dark. 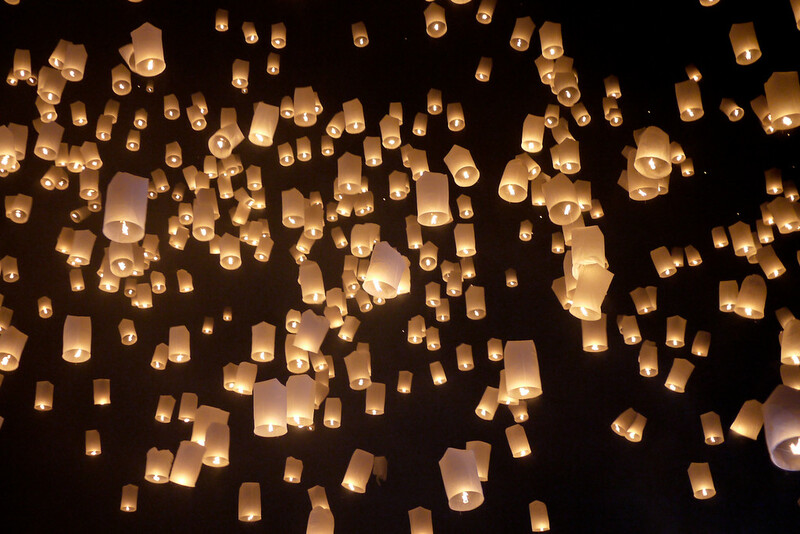 I looked down at Ana as the blanket of lanterns floated higher. The distant pinpoints of light painted slow-moving constellations across the night sky, and I saw the light sheen of tears echoed in her eyes as well. The release lit a spark of sweet hope for this coming trip with Ana. The collective energy swelled around us, filling me with enough giddy anticipation to do a little dance to the cheery Loy Krathong song still pumping from the speakers. 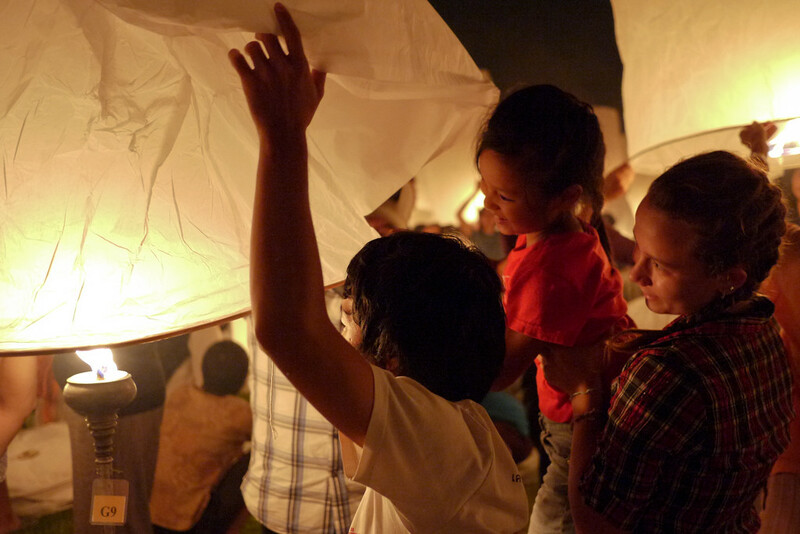 The lantern release takes place a bit outside of Chiang Mai, at a temple complex near Mae Jo University and the evening event jump-started an entire week of Yee Peng festivities. 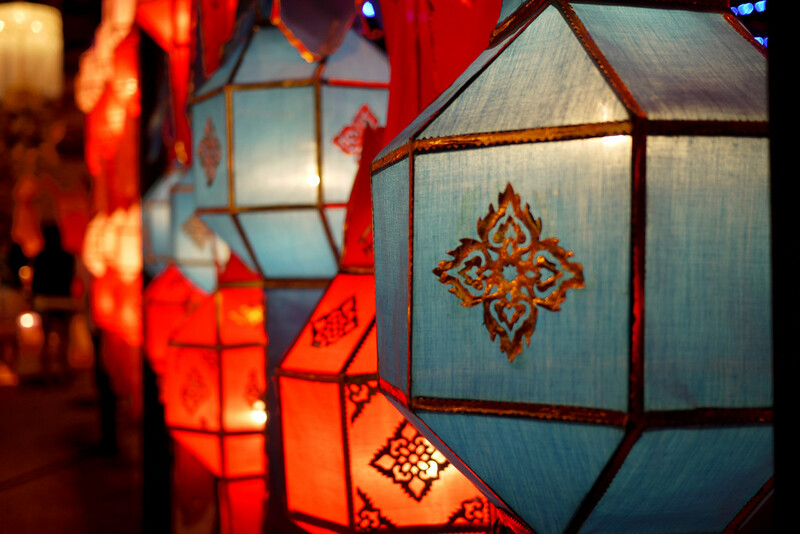 Yee Peng and Loy Krathong coincide on the Lanna Thai calendar and the joint celebrations make for one massive maze of lantern parades and krathong ceremonies throughout the week. In the months leading up to Yee Peng and Loy Krathong, the most predominate imagery on the internet associates this week with the lantern release — and while the group lantern release lit wonder in hope in me as I watched them all float away, the festival traditions are more fully rooted in the krathong release, with the paper lanterns a more modern accent to the handmade and carefully crafted banana-leaf krathongs. 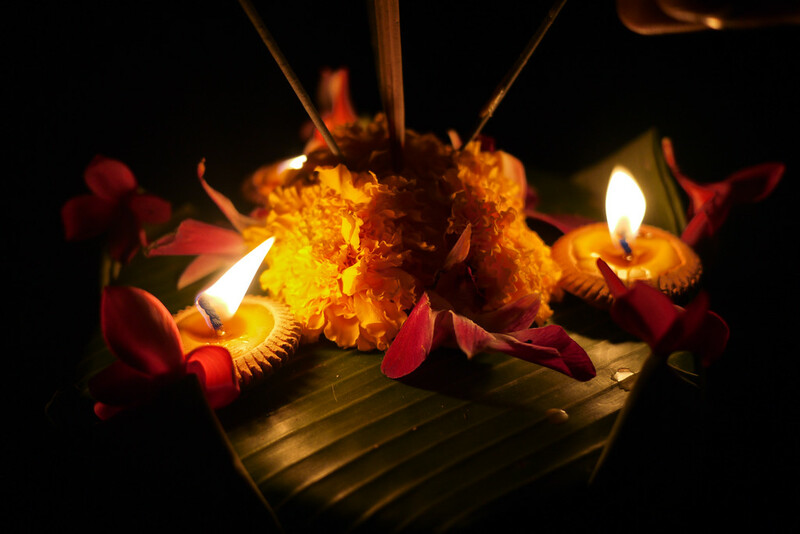 Loy Krathong occurs at the end of Thailand’s rainy season, a period of time when water nourishes the rice for a productive harvest season and the rivers flow, full and swift, toward the Gulf of Thailand. 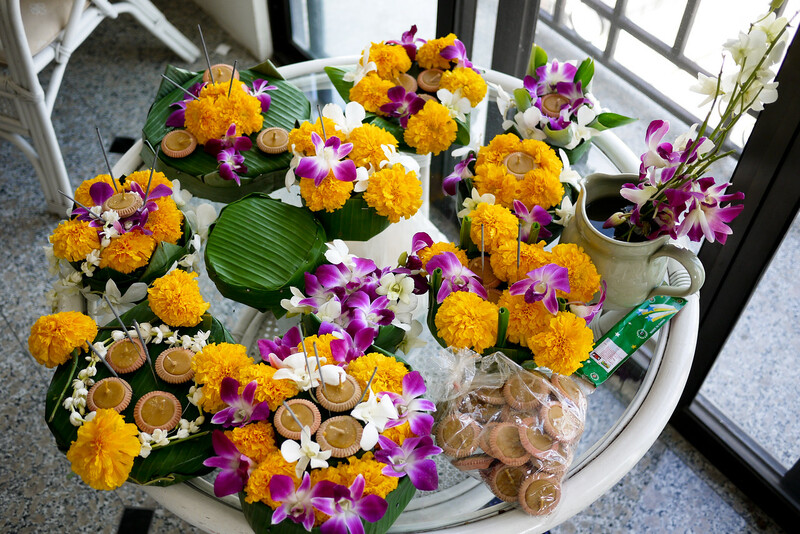 The ceremonial releasing of these small lotus-shaped rafts takes on a dual role, it serves as an offering of gratitude–a symbol of appreciation for the rains, as well as a releasing of the bad habits, grudges, anger and negativity in ones own life. Earlier in the day, Ana and I joined two friends for a late morning craft party as the crisp sunshine filled the room with clean light. 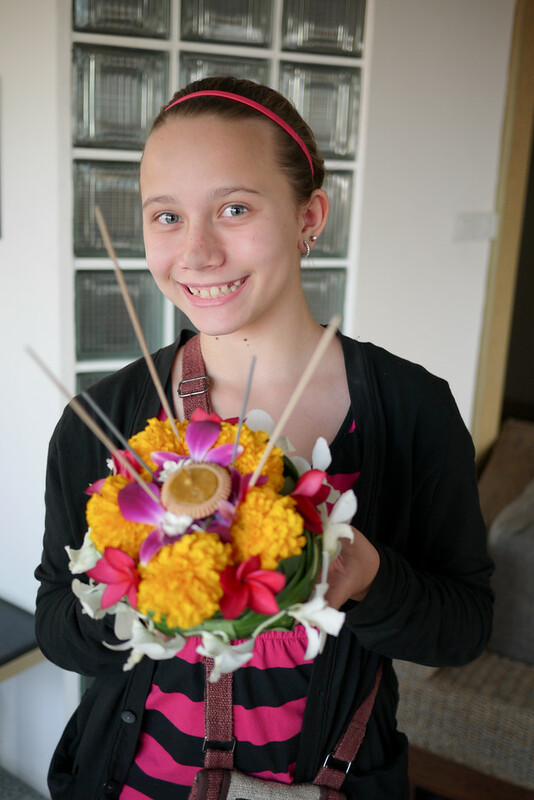 The sounds of the motorbikes weaving through Chiang Mai’s streets created a distant hum nine floors below as my friend Naomi proffered the supplies she purchased at the nearby market: banana stem bases, deep green banana leaves, and an array of fresh flowers, candles, incense and sparklers. 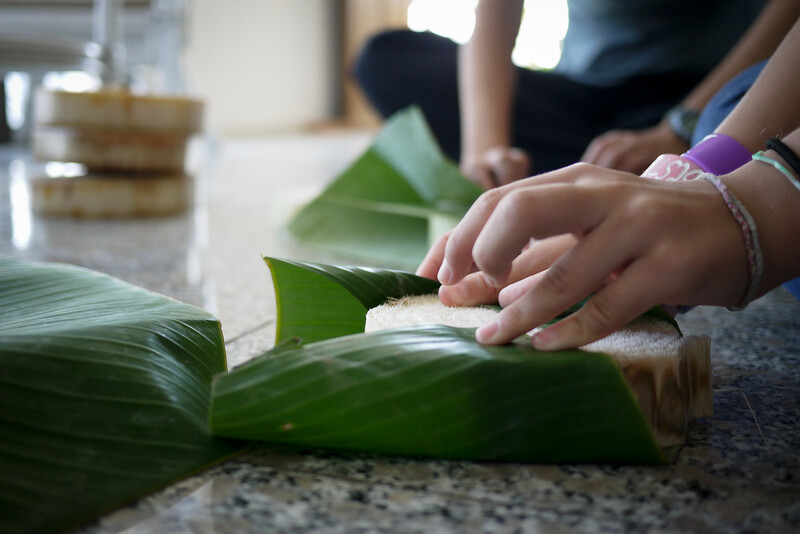 Next week I’ll share more about the process of making a krathong, suffice to say we worked diligently for several hours until we fully decorated each base and prepared them for release that evening. 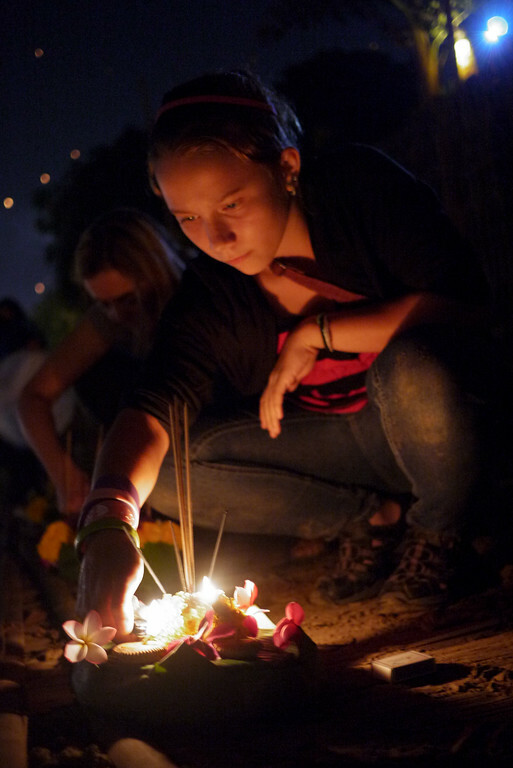 As the sun sunk low over Doi Suthep, a nearby mountain peak, we bagged our krathongs, wove through the light crowds. Our group started with drinks at Brasserie, a restaurant on the Ping River, where we chatted until full darkness settled over the city — well, as full darkness as expected on a full moon night. We allowed several hours to pass with easy conversation. 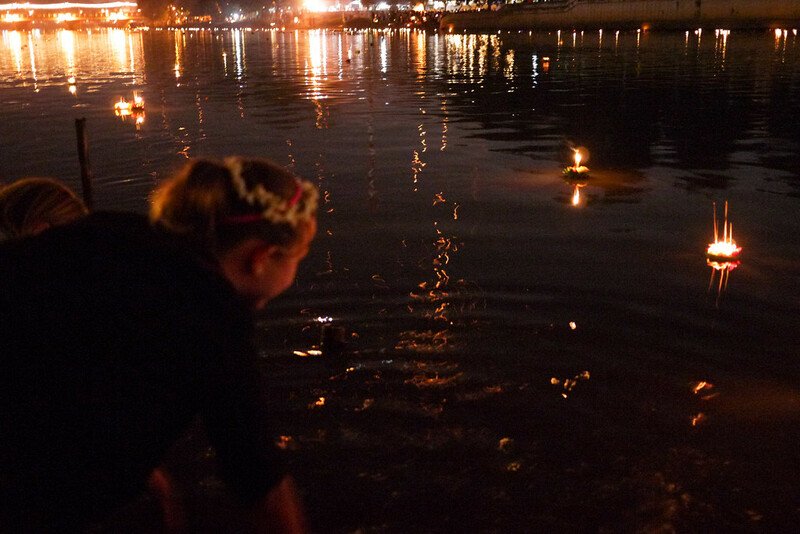 The river began to fill with candlelit rafts. 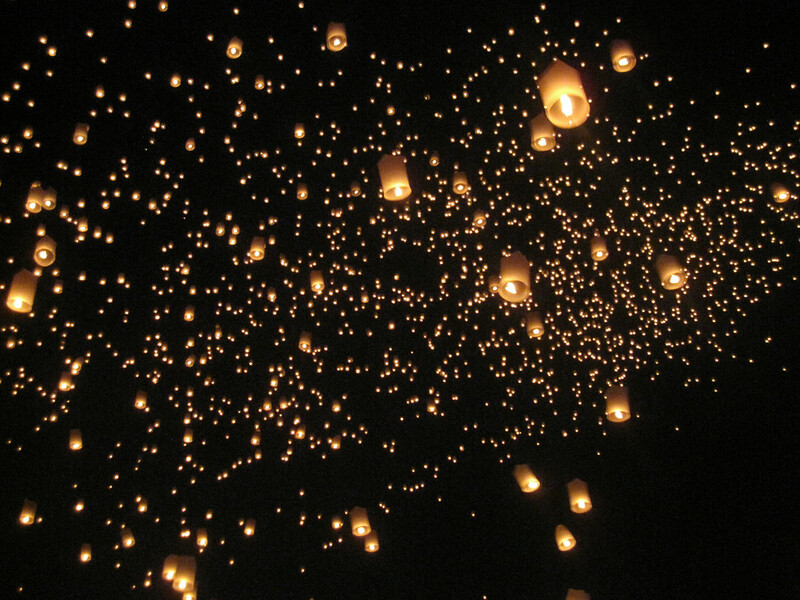 The sky lightened once again as thousands of lanterns from all over the city danced like fireflies in the night. Several hours later, the crowds swelled across the river. Our small group of four gathered our handmade krathongs and stepped down to the quiet river’s edge on the restaurant’s peaceful private dock. We re-positioned misplaced flowers and jostled incense sticks before lighting the candles, making one last wish and hope. Then we released them one-by-one into the water. 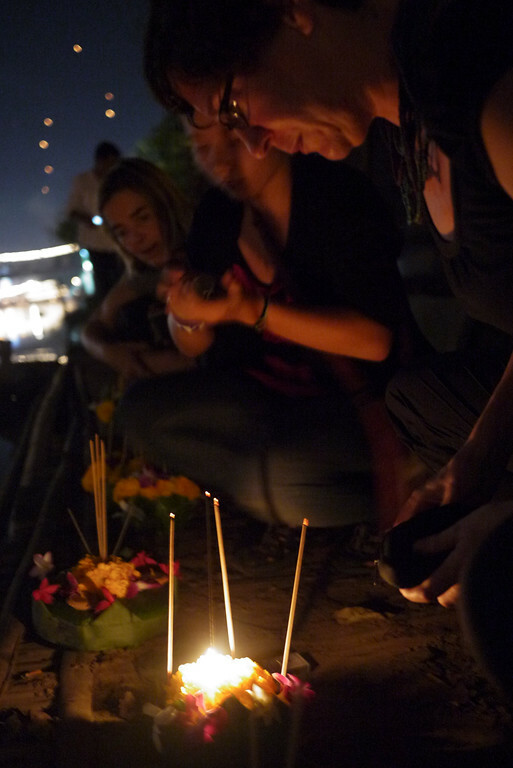 I watched my handmade krathong join Ana’s meticulously decorated raft near the shore-line; we stared at the river, captivated by the flickering candlelight and stream of fragrant incense creating patterns in the dark night. We gently splashed the water until our krathongs caught the swift current on the Ping River and became indistinguishable from the herd of floating krathongs, each one an offering hope, a chance for atonement, gratitude and thanks. The group lantern release was an inspiring event — in fact, it tops the charts as one of the most beautiful festivals I’ve attended. Thailand is my adopted home, and I’ve also traveled around Thailand a good deal too. And beyond the beautiful, there’s something magical about learning about the culture through these festivals. 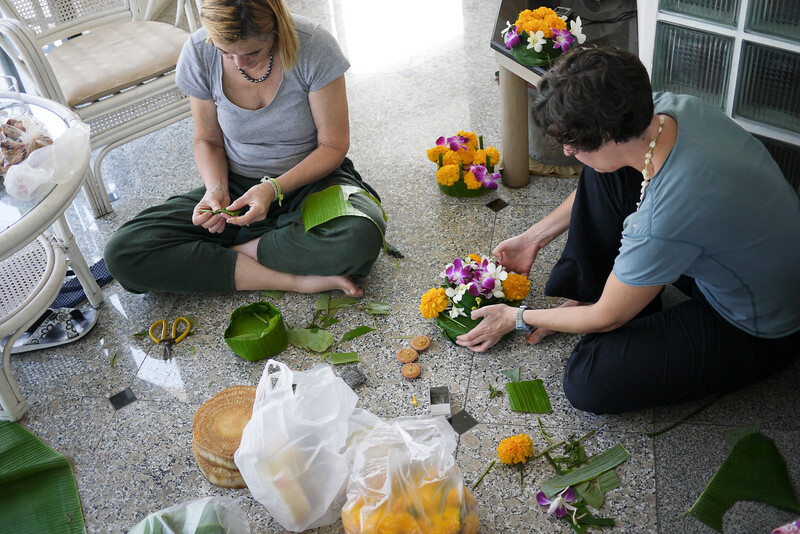 For that reason, releasing our handmade krathongs alongside the Thai, was magical. Our rafts of hopes and wishes joined thousands of others, meeting on a river and moving beyond the realm of language, culture, or religion. We used that raft and the river’s water to cleanse the mind and spirit and start this new year fresh and open to the possibilities. How delightful are the night photos! What kind of camera did you use? If I understand correctly, it was NOT a phone! Because 7 years ago, when this post was written, the phones still did not have such good cameras as now =) Probably, Canon PowerShot S-series? 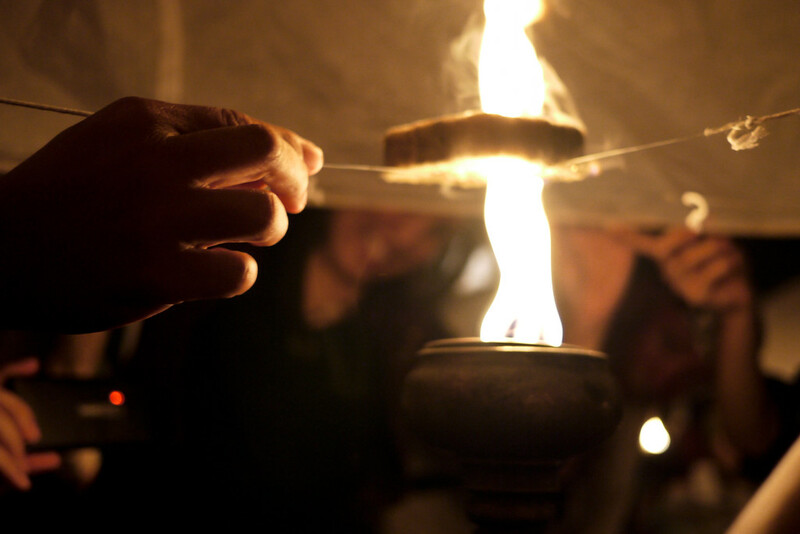 The lantern release looked amazing, its really great to view spirituality blended with creativity. Beautiful glance of Thailand you have shared with us here. Thanks for posting such an edifying article…. Pretty impressive photography in low light…. Beautiful photos of the event! We hope to be there next year to see, feel, smell and experience all of it! Your writing and photos made me tear up a little bit too, especially imagining how Anna must have felt to be part of something so incredible. I’ve spent a little bit of time browsing through your blog today and I’m adding to to my list of regulars. Thanks for writing, and sharing your photos! Wow, gorgeous photos! Those lanterns and flowers are absolutely stunning! Thanks for sharing. Hi Shannon , angela here .. I think I’d like to add this festival of lights to my todo list , my cousin lives in chang Mai , he teaches English there, he’s spoke of the many festivals , this looks great! Amazing.. just like the movies. What kind of lens did you use for these pics? Thank you Gerard :) I used a 20mm lens on my Panasonic micro-four-thirds camera, it doesn’t usually do low-light situations very well, but the light from the lanterns was enough to make it perform pretty well! What a beautiful story about a traditional festival, would love to see this with my own eyes one day! I’ve always found this ritual exceptionally beautiful. I see some kind of merge between tradition and hope, shared by the people! Amazing! I was jealous of the CM crew who got to witness this spectacle last year. And here I am finding myself green with envy once again. Beautiful photos Shannon! And what an amazing experience for Ana. What a cool experience! Loved Ana’s post on it, too! Great post and the pictures were absolutely fabulous. 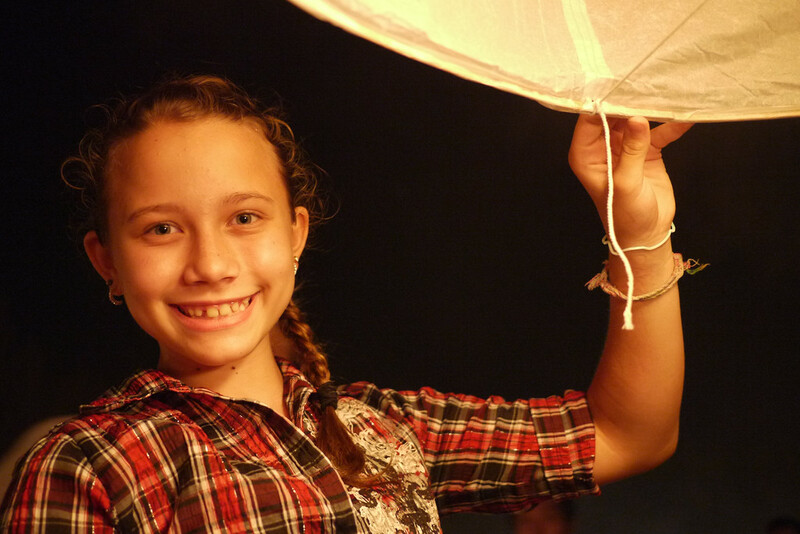 The joy in everyone’s face at the lantern ceremony made me smile with them. Absolutely beautiful article and what wonderful, wonderful, wonderful pictures. I am so happy that Ana got to experience this, too! Seriously breathtaking post, I am hoping that I am lucky enough to be able to participate in something like this in 2012! I was just thinking about how you haven’t posted anything for a few days and was wondering how your journeys in Asia were going with Ana. 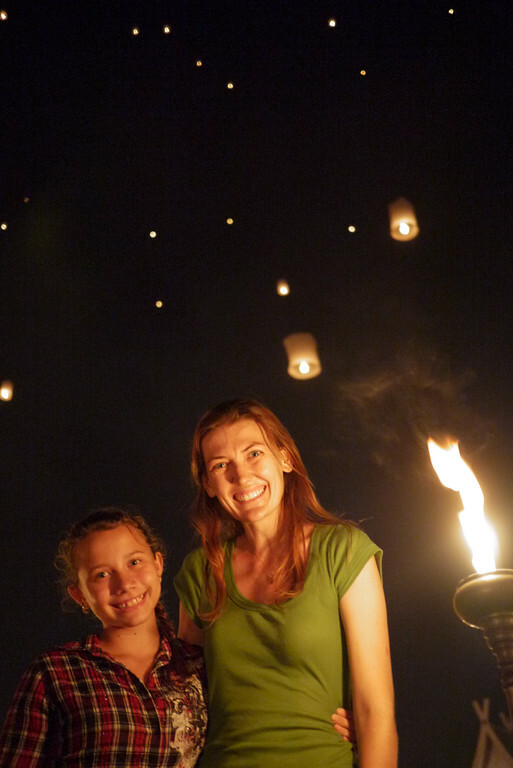 It looks like you’re having fun – those lanterns are beautiful! I hope I get to witness this first hand one day–but thank you for the vicarious adventure! It is worth coming to the North of Thailand to see, definitely :) Cheers and thanks for stopping in and commenting! Not only is this my favorite post of yours, it also contains my favorite photos of yours! BRAVO darling!!! I’m dying to attend this festival. I think I would be in tears the whole time from the abundance of beauty. Such a magical and beautiful blog! Wow! What a beautiful post, and a special experience for you and Ana to share. It sounds so magical – thanks for sharing with us!